Note: Since this story was originally written, the church in Pakistan has quickly grown, creating some tension and causing people to become concerned for their safety. The name of the individual who sought out the Rev. Bill Webster has been changed and the exact location of the church is being withheld. The Rev. 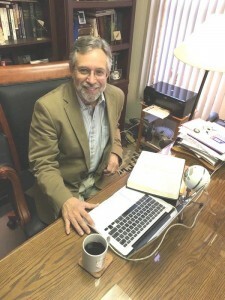 Bill Webster does a Skype sermon to Pakistan once a week. The gathering has grown from 11 to over 70 in a short time. The Rev. Bill Webster preaches multiple sermons in a week’s time. That’s not too unusual. What is unique is that one of those services is in Pakistan. The pastor at Grace Presbyterian Church in Martins Ferry, OH, has been leading a worship service on Tuesdays in Pakistan since mid-January. What started out as a Bible study for 11 people has blossomed into a full-blown church for over 70 Pakistanis. Bill delivers his message through video-conference program Skype to a house in Pakistan where a man translates the sermon into the native language of Urdu for those who have gathered. “There’s a real hunger for understanding what the Bible really says,” Bill explained. “From what I understand, a lot of Muslims and Hindus know that there are holy scriptures, but they’re not encouraged to read the Koran for themselves. They’re more encouraged to do what the religious leader tells them. In Christianity, we’re giving them Bibles and saying go and read and see what this is all about for you. It all started at the end of October when an evangelist, who we’ll call “Peter,” reached out to Bill to see if he was interested in helping him lead a gathering. While there is a strong Presbyterian presence in Pakistan – the Presbyterian Church of Pakistan has roughly 340 churches and 400,000 members – there is not a Presbyterian congregation in this community. “It’s all Muslim, and yet it’s considered a Christian district,” Bill said. “Peter” found Bill by searching Presbyterian church websites and Facebook pages in the United States looking for a minister to help start a program. Grace PC livestreams its services on its website, and Bill assumes that’s most likely how “Peter” learned of him. Initially looking for some tips, Bill was more than happy to help “Peter” – who calls Bill “Dad” – get his ministry off the ground. Bill agreed to lead the Bible studies on Tuesdays, and as word spread about what was being taught in “Peter’s” house, the attendance quickly grew and the Bible study turned into a Sunday-like service. 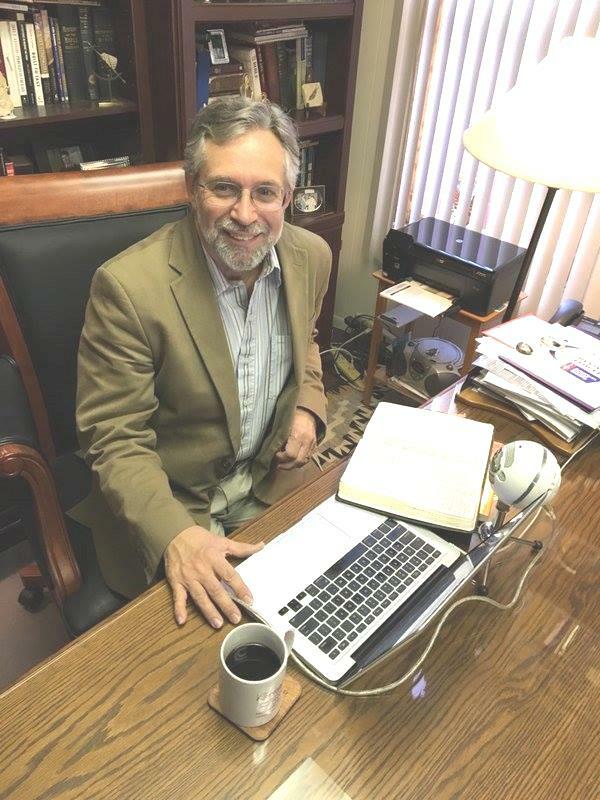 With there being a 10-hour time difference, Bill starts the worship service shortly before 9 a.m. in Martins Ferry so that it can be broadcast in Pakistan at 7 p.m. as the people are returning home from their jobs. There is no outside visible mention of the church in Pakistan. In fact, “Peter” bought a banner to help authenticate the church but it hangs in his living room – not outside. In the Middle East where religious persecution is well documented, new threats are springing up surrounding this young congregation. Bill did reach out to the General Assembly of the Presbyterian Church of Pakistan to make sure everything he was doing was legal but has not received a response. As far as what Bill is preaching, Grace PC has two services on Sunday and he uses the same scripture that is presented on Sunday evening for his worship in Pakistan. Because of the distance, there’s a seven-second delay with the Skype broadcast. Bill also has to stop often so that “Peter” can translate from English to Urdu. And there is only one hymnal that is used by the church in Pakistan and until recently there was only one Bible. “Peter” would like to name his congregation after the one in Martins Ferry – Grace Presbyterian Church. It would be fitting since the Martins Ferry congregation is taking steps to create a mission to help support its brothers and sisters in Pakistan. “God is uniting us and taking barriers away,” Bill said. “We are connected through the Holy Spirit. We may be separated by thousands of miles – by a continent – but we’re connected. God has united us together. Despite our differences, he has brought us together and is making us one despite language and cultural differences. We’re growing the kingdom of God, and not just by one or two people, but by five and 10 at a time. And it’s growing in a place where we thought nothing could be done.